In a speech by the President George W. Bush in 2004, the U.S. government set an ambitious new course for NASA, with an explicit objective to further explore the solar system, and ultimately send humans to Mars. Although NASA’s near-term objectives for exploring Mars focus on further robotic exploration of the Red Planet, the robotic missions are designed to set the foundation for human expeditions. The European Space Agency also intends to send a human crew to Mars. Yet because of the steep costs and risks involved in a human expedition to Mars, many argue that humans should not be sent, instead favoring robot-only missions that would attempt to accomplish the same goals. Some of the key arguments for robot and for human exploration of Mars are outlined below. The question of whether the benefits of human exploration of Mars would outweigh the risks and costs is subjective and highly complex. 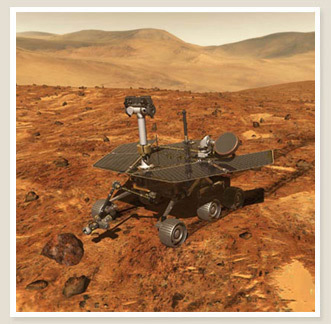 Exploration Although early expeditions often ended in failure, robotic explorations of Mars have improved. Robots can be sent where humans cannot yet go because they are more expendable and run on less physical support and supplies. Continued gains and achievements in technology will allow robots to further explore Mars and answer key scientific questions. Direct human experience of space has altered our perspective and added greatly to our scientific knowledge. Robots are limited in function and need human guidance (which is very slow to transmit over the vast distances between the planets). Humans could explore the terrain of Mars much faster, could react and follow up on discoveries, and obtain more scientific samples. Science Precise and highly accurate, robots are extremely effective when accomplishing specific and pre-programmed tasks. Unless provided with poor instructions from a human, robots eliminate the risks of human error. Humans can make important decisions and use ingenuity to perform functions on the fly. They can gather more data and respond better to the information in real time, thereby greatly advancing new discoveries. Operations The flight to Mars will be long and mostly automated. A human crew may get bored or experience psychosocial problems. Robots don’t need heavy and large supply stocks of oxygen, water, food or conflict resolution. On a long mission things will break down. Humans can problem solve and respond quickly to the unexpected. Problems similar to those faced by the failed Mars Climate Orbiter and other missions might have been solved by a trained human crew on-location. Communication Because of the distance to Mars, communication delays of up to 44 minutes make it difficult and slow to control robots. Robots must wait for further instructions before performing additional tasks. Loss of communication would have serious consequences on a robot mission. Humans are autonomous first responders and don’t need to wait for instructions. Humans can still perform the tasks required and effectively continue the mission even if contact with the ground is lost. Mission Plan and Goals Robots are good at completing specific tasks and gathering specific information to be sent back to Earth for interpretation. Creating and executing a mission plan is relatively straightforward. Return is not required, which is an immense savings on supplies, food, fuel and mission complexity. A human crew could answer larger questions, instantly interpret results and make revolutionary discoveries. However, creating and executing a mission plan to get humans successfully to Mars and back is the biggest challenge NASA has ever faced. Cost Robot missions are relatively economical, as supplies and return trips are not required. Humans are bulky, fragile and expensive to maintain. The cost for a human mission would be in the billions—some estimate in the hundreds of billions. But some argue the scientific gains of one human mission would be worth that of 10 robot only missions. Risk Mars missions have a historically high failure rate. If a robotic probe is lost, it can be rebuilt, but human lives would be lost forever. Robots can exist on the hostile planet, weathering radiation and dust storms better than humans. If astronauts do come back alive, they may face long-term health problems. Human safety cannot be guaranteed, but this did not stop the Apollo mission, or Earth’s early explorers. Humans also have the ability to quickly recognize and take steps to avoid dangerous situations. Robots can only react to situations predicted at the time of their design/programming. Publicity The Challenger and Columbia space shuttle disasters were tragedies and public relations disasters for NASA. A failed human mission to Mars would damage the program’s credibility and could mean a loss of funding. We’ve long dreamed of a human mission to Mars. Apollo was the beginning of making that dream real. The spirit of adventure drives interest in the space program. People may lose interest in a slow and steady exploration of Mars by robots alone. Broad public enthusiasm is important to consistent, long-term funding. Overall Recent robotic missions have been relatively successful. Robots are capable of doing science in a precise way. Technology continues to improve. The history of Mars exploration has been leading up to a human mission. Even though it is risky, this will be the greatest adventure of our lifetime. Plot of objects tracked in Earth orbit. Note higher incidence of objects in geo-synchronous orbit. Although it doesn’t diminish the expense or risk to human life, sending both robots and humans to Mars on a single mission could mean much more could be accomplished. Robots would provide assistance and deliver specific results. Able to be controlled in real-time by the human crew with no time delay, robots could explore terrain first to ensure safety, or explore the areas astronauts don’t want to go. There may be as many as a million pieces of space junk currently orbiting the Earth, the vast majority smaller than 1cm in diameter, with some 10,000 objects larger than 10 cm. 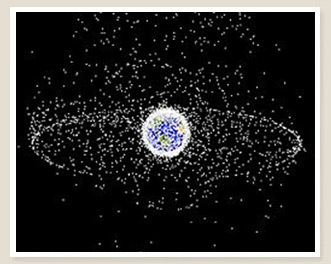 More debris is lost in space or left on other planets, including Mars. Space junk travels thousands of kilometers an hour in orbit, making it dangerous to spacecraft. Although the larger pieces of debris are closely monitored, there’s no budget to clean it up. Paint chips and fuel fragments. A speck of paint from a satellite once dug a quarter-inch pit in a space shuttle window. A 1mm metal chip could do as much damage as a rifle bullet. A metal sphere the size of a tennis ball is as lethal as 25 sticks of dynamite.